Learning Target: I can recognize and evaluate a function. inviting you to join a course. Go ahead and do that. ‘ll tell you why in class. Out at the Canvas course, you will see an online practice assignment named “Domain and range: Is it Linear?” That is some online practice for today’s and tomorrow’s work. Optional Problem Set to replace a low PS grade. Today’s work if you are not finished. In Class: I can identify if a function, defined by an equation, a table or a graph is linear. Learning Target: I can find the slope, y-intercept, and x-intercept of a linear function. Then get some practice finding these values. Today Mrs Chobanian is going to be working with you. I’ll see you tomorrow. Get some sleep tonight. Have you collected your 30 pieces of data yet? PS 4 is due Thursday. Please do not wait until the last minute. if you want some help or missed a test/want to retest, make sure to book some time with me during Callback or see me Wednesday evening after school for 8th grade help night. Sometime this week, you have to take the StarMath assessment. This is a testing tool the OHS Math Department is trying this year to check for areas of strength and areas in math where you need some support. I thought today would be a good day to do this. Grab your computer, go to this <link> and wait for instructions. For your serious attempt, I’ll give you a Self Direction grade. Learning Target: I can determine if a relationship is a function and if it is linear. For practice we will turn to Moodle> Unit 2>Function Practice. Print it (B-Wing Cloud printer) if you want to work on paper. Then return to submit your answers. None. I’ll give you class time tomorrow to finish this work. More practice with this learning target. Get that online practice finished. if you have this done, get your collected data into a spreadsheet and submit the share link through Moodle. You will see the place. There is an optional online version out at KutaWorks. Get your notebook put together. PS 3 if you are not done. If you want to review your test, call me back. I’d rather not do this in class. Overall Nice job folks. If you do not like your grade, get some practice and retest. Learning Target: I can find a numeric summary for a data set using a spreadsheet. I’ll walk you though the spreadsheet work. Learning Target: I can create graphs using a spreadsheet and import them to a Google doc. Make sure that your notebook is up to date. PS 2 s also due tomorrow. Hopefully you did not procrastinate! Hopefully no retakes are needed however, if you want to improve your grade. Come and see me at CallBack Tuesday or Thursday or at PM Help on Wednesday. Today’s practice problems if you are not finished. Friday: No school for you. See your Tuesday. Fourteen days remaining in the marking period. More practice with the Learning Target: I can solve equations with variables on both sides. Optional: There is an online Kuta Works worksheet available on this material. Let me know if you did it and I will add in the grade. Use Call Back (Tue/Thur/Fri) if you still need to get some practice and retest on the quiz from last week. Learning Target: I can solve Literal Equations. Optional KutaWorks Online. Let me know if you complete it so I can add in the grade to MMS. Practice Review getting you ready for a quiz on Friday on Solving equations with variables on both sides + Solving Literal Equations. Time to work on your Problem Set afterwards. No HW if you have the problem set completed. Otherwise, get it done. Review/Practice/Study for Quiz 1 tomorrow. We will look at the practice test I gave you last Thursday. Here is a preview of the kind of questions I’ll ask you on this pencil and paper quiz. <link> Completing this practice quiz at the 90% level earns you 5 bonus points on the quiz tomorrow. See your Oxbow email for the class code. Study for this quiz by completing the online practice quiz. Bring your Notebook to class as you can use it on the quiz. Combining like terms and applying the distributive property to solve equations. I have a paper based set of retest practice problems + I loaded it out at the KutaWorks site for even more practice. Learning Target: I can solve equations with variables on both sides. I’ll be available for Call Back today. Come on down to my A-2 Room if you sign yourself up or if I call you back. Practice Solving Equations with variables on both sides. PS 1 Due Tuesday. DON’T wait until the last minute. Any work that you did not complete this week. 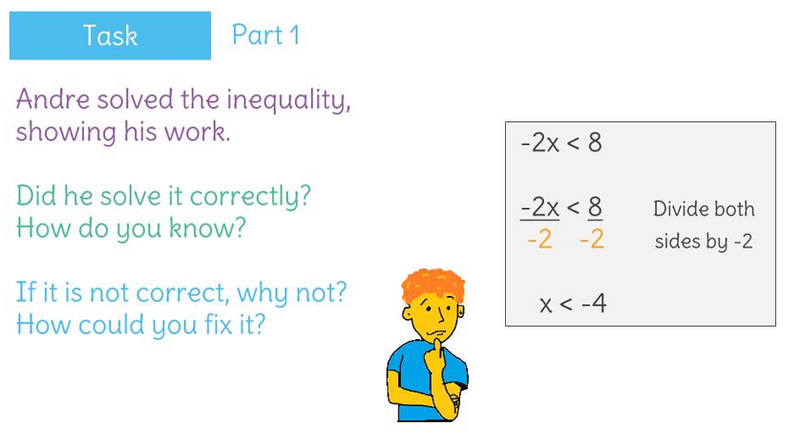 Learning target: I can solve equations requiring the distributive property and combining like terms. Practice puzzle using the Distributive Property and combining like terms. Quiz on the Order of operations, Solving one and two step equations and Solving equations requiring the distributive property and combining like terms. Problem Set 1. Due Wednesday 9/19 at the start of class. Learning Target: I can simplify numeric expressions using the Order of Operations. Graded Assignment: Moodle>Module 1 – Linear – One Variable>MOM- Order of Operations Graded Practice Due by Friday 9/7. Complete your work on paper as needed. Learning target: I can solve one step equations. Today’s work if you did not complete it. I am available for Call Back 2 Today. Bell Ringer 2. I am waiting to see how you did on the last one. Learning target: I can solve two step equations. You can start working on the Next Moodle MOM assignment if you have time. Learning Target: I can solve equations with like terms or distribution. MOM Order of Operations assignment is due by Midnight. Hopefully you have not waited. Complete the Who am I sheet. Due Friday. Make sure to include 2 people you like working with and if there are two people you will refuse to work with. Learning Target: I can correctly apply the order of operations.